Episode I recounts the story of Napoleon’s extraordinary rise from Corsican obscurity to the victories in Italy that made him a hero to the French people and convinced him that he was destined for greatness. It also tells of his love for Josephine Beauharnais, a woman of extravagant habits and tastes, who did not at first return his passionate affection. 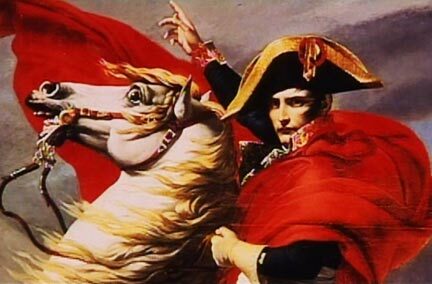 Episode II charts Napoleon’s ascent to absolute power, from victorious General to first Consul to Emperor of France. It describes his extraordinary achievements – from the Napoleonic Code and the Bank of France, to bridges, roads, and canals – as well as the tyrannical nature of his rule and the violent opposition of most of Europe. Episode III witnesses Napoleon conquer most of Europe in a series of brilliant triumphs, including his legendary victory at the Battle of Austerlitz. To sustain his rule, he must keep fighting. But when he invades Spain, he has begun to reach too far. Episode IV describes Napoleon’s downfall, including the invasion and subsequent retreat from Russia, and his final battles, in which all of Europe is arrayed against him. Exiled to Elba, he returns to France after just ten months, only to be defeated for the last time at Waterloo. Napoleon spends his final days exiled on an island far out in the Atlantic, where he writes his memoirs and reinvents his legend.